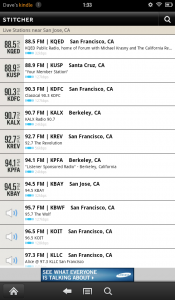 Many people have come to associate their mobile devices as being audio devices. 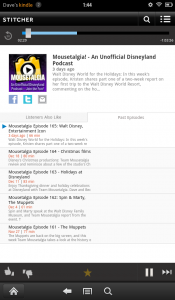 We download our music and podcasts to listen to while we are traveling and generally mobile. The Kindle Fire was designed as an e-reader first and tablet second. 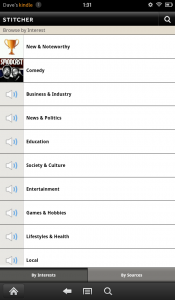 As such, the Kindle Fire doesn’t have an inherent ability to listen to podcasts. 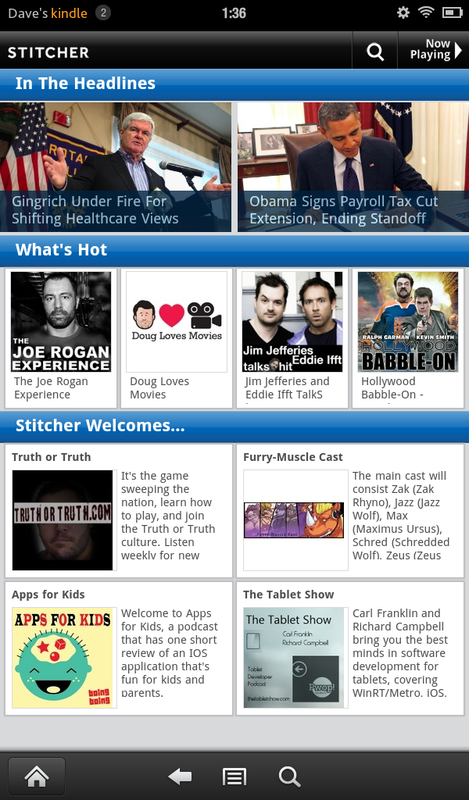 Stitcher has been available for the iOS devices for awhile, and now is available on the Kindle Fire to fill this podcast void. 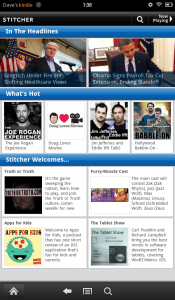 In general, the Stitcher app is designed to provide streaming access to radio stations and podcasts. 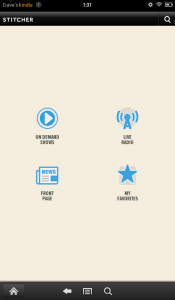 When you launch the app, you get a simple splash screen and are then presented with the main menu. Nothing too earth-shattering at this point, but they do have a nice clean interface to get you going in the direction you’re looking for! 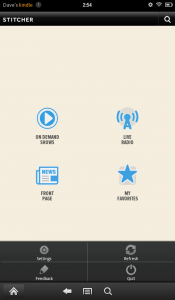 If you select On Demand Shows, you are presented with a variety of categories to help you find recommended content that they have indexed. You’ll find fairly popular and nationally known shows and programs. 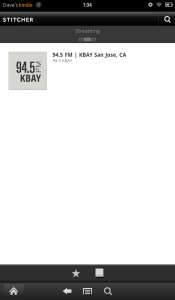 If you select “Live Radio” from the main menu, you are taken down a series of selections to perhaps find a local radio station. Here we selected “California” and then “San Jose”. 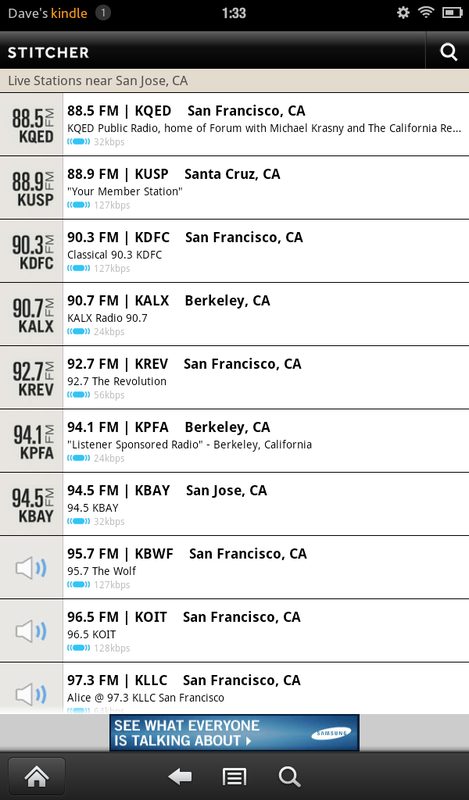 We’re presented with a list of radio stations in the San Jose area, which Stitcher knows about and can stream. 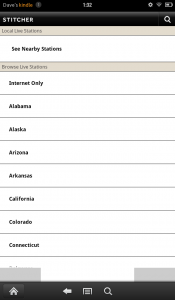 Select the station you are interested in, and it will begin streaming to your Kindle Fire! Now we can head back to the main menu and select “Front Page”. The Front Page section provides a newspaper style view of audio and video that is perhaps newsworthy. Once again, we’ll head-back to the main menu, and select “My Favorites”. 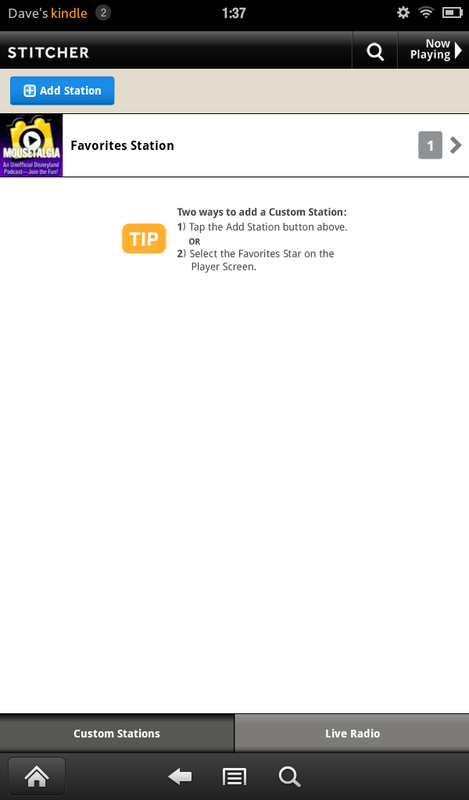 You are able to create “Stations” to group podcasts and other feeds. 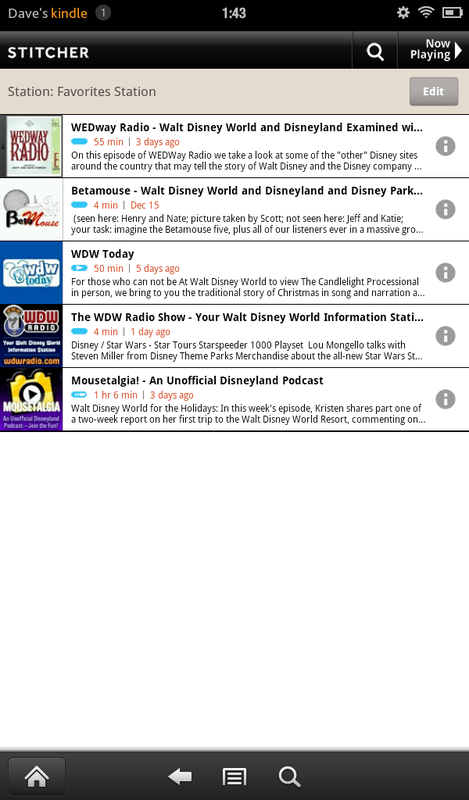 Here we’ll select the “Favorites Station” which has some of my favorite podcasts. Here we’ll select the “Mousetalgia! – An Unofficial Disneyland Podcast“, and it will begin streaming and buffering the latest episode. 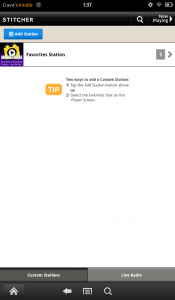 You are provided with a simple interface to stop, pause, etc. 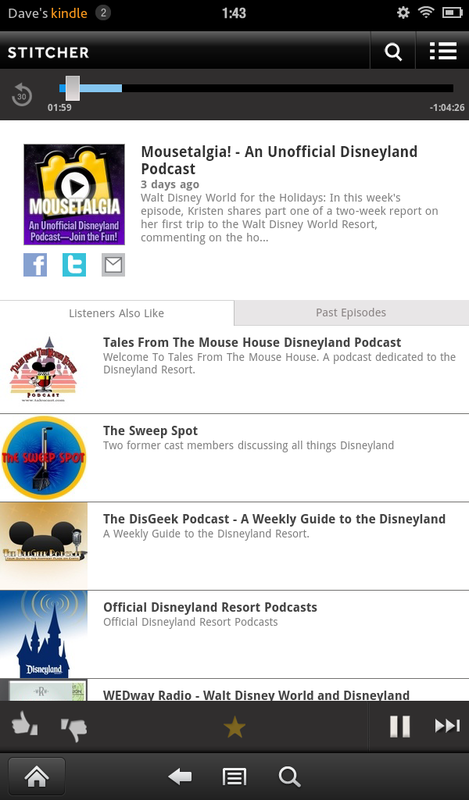 At the bottom, you’ll see recommendations for similar content as “Listeners Also Like”. 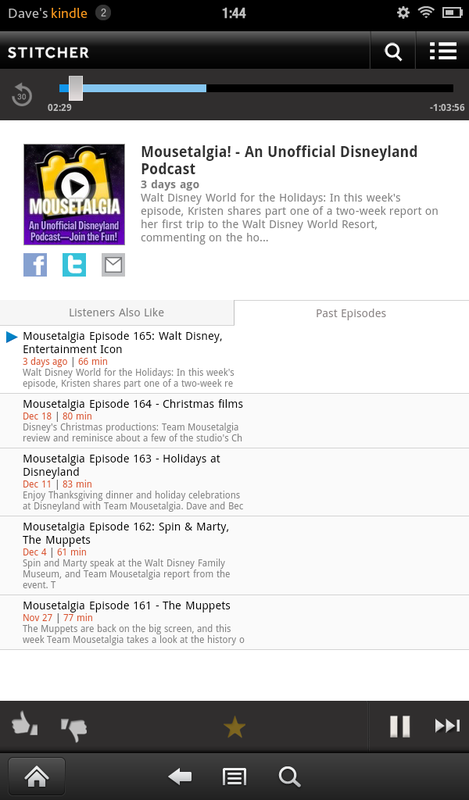 Additionally, you can tap the tab to see “Past Episodes”, if you are looking for earlier content from the publisher. Finally, if you select the Kindle Fire menu button at the bottom of the screen, you are able to access customization settings are force a refresh of the content. Overall, this is a great app to use as a portal to online media, and doesn’t force you to use the limited storage space on your Kindle Fire. 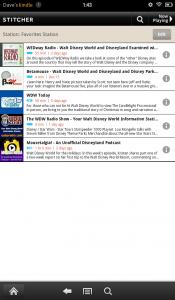 They seem to have spent time to make a clean usable interface, without cluttering it with a lot of junk. It did feel as if there were a lot of clicks/taps to get to the live radio. I’ve often heard that a user should be able to get to the content they want in 3 clicks or less. 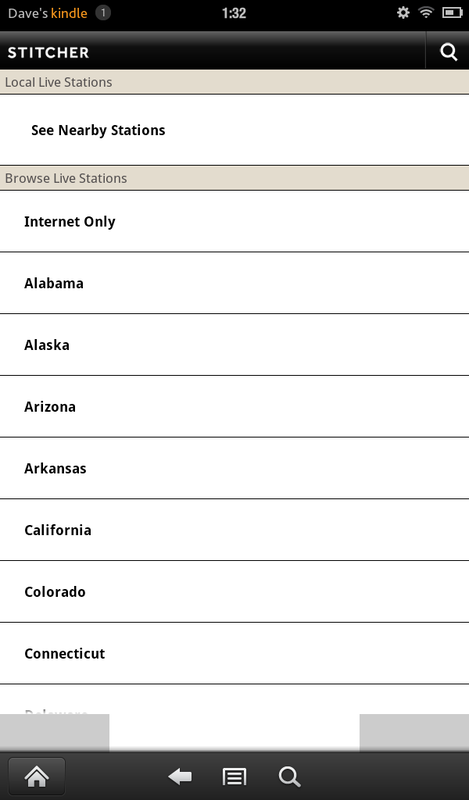 Perhaps they could provide a zip-code search or similar, since the Kindle Fire is unable to assist in the “Locate Nearby Stations” option. 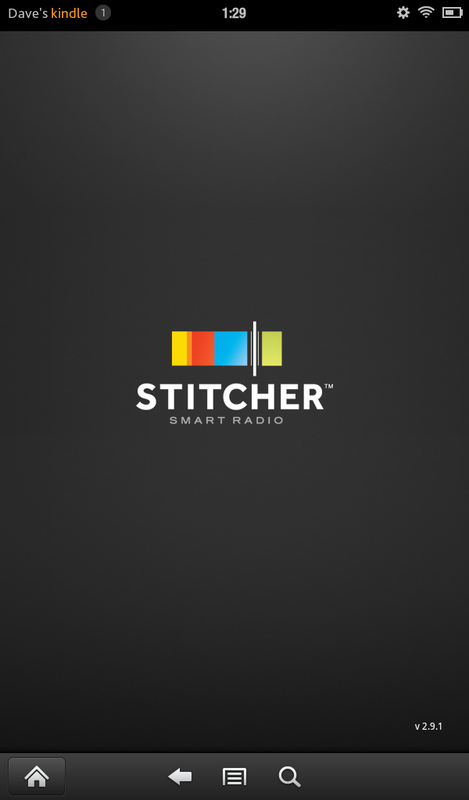 Listen to more than 3500 of the best news, talk, sports, and entertainment podcasts, or tune into the live streams of your favorite local talk radio stations with Stitcher Podcast Radio. It’s easy – no cables, no synching, and no memory storage. 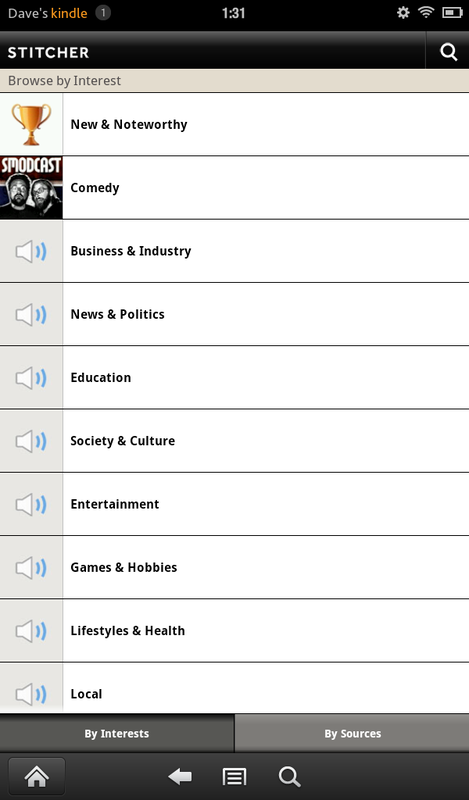 Just pick a topic, start listening, and Stitcher will learn your interests, begin personalizing your stations, and help you discover new shows. 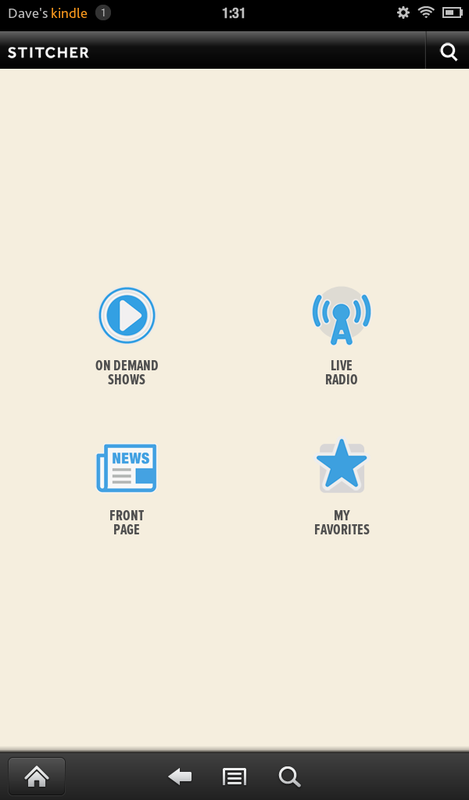 Or, create a custom station featuring your favorite podcasts, hand-picked and placed in perfect order, and listen on your morning commute, your run, or just while catching up on your interests. 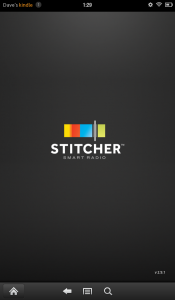 I’ve had my Fire for about a week with no issues – except when I leave a station streaming via Stitcher, the Fire eventually locks up and requires a hard reset. Any similar issues out there? I haven’t seen that problem yet myself, but I’ll keep an eye out for it! Ah the joys of being “early adopters”!